And help us raise money at the same time! Throughout the year we have many fun and entertaining events. We enjoy it when our friends and family participate and would love you to join us. Check back here often to see what fun we have planned! Warm up your paws on Holloween night with Ruthie's famous hot cocoa & hot cider! Ruthie's Boutique will once again sell hot cocoa and hot cider on Winthrop Street (also known as Hell Street) in Provincetown on Halloween night, Monday, October 31st from 7:30 pm until about 9:30 pm. but when it does you don't want to miss it! Look here for specials at the store, like our famous $1 a bad sale. Stuff a bag and only pay $1! Upcoming dates to be announced. well, it's more like our second one. See how stylish you can be by wearing outfits found at the thrift store. You don't need to spend millions to looks like a million bucks. Come watch them strut their stuff down the runway at Provincetown's fashion event of the season. To be announced. Help Ruthie's design a new logo for the boutique. Can you help? Ruthie's needs a logo and we're asking our friends to help us design one. So we're having a contest and we want YOU to get involved. 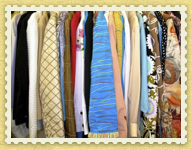 Come up with an original logo for the thrift store and win a gift certificate to Ruthie's.